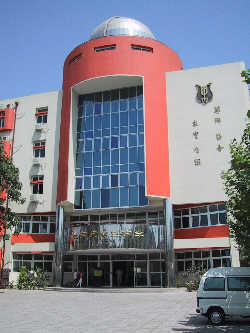 Our partner school, Middle School No. 5, is not located near a main road, but in the centre of a hutong, surrounded by one-storey traditional old houses of the capital. Moving along the narrow streets of the hutong where countless cyclists try to pass and the pupils of Middle School No. 5 stand out due to their blue school uniforms, you will suddenly find yourself in front of the large entrance door of the school and take quite a surprised look at the newly renovated façade of the school, the shining white-red-blue being quite a contrast to the grey houses of the environment. At the door there are several uniformed men and some pupils, friendly smiling to the arriving guests. These students have been successful in their lessons and therefore get rewarded now by being the reception committee. As most of the students come to school by bike, there is an uncountable amount of bicycle stands in the inner yard of the school and each class has its "bicycle parking guide". The Chinese school day is a very long day: It starts at 7:30 in the morning and mostly finishes at about 4:00 in the afternoon. In case the students still attend classes of optional subjects, they might stay even longer. After the fifth lesson there is a long lunch break of two hours. Lunch packets will be distributed to those who have paid for it and they will eat it in their classrooms. Those who have not ordered any lunch go to the snack bar across the road or to the restaurant at the net corner. School starts with gymnastics, which everybody likes very much. 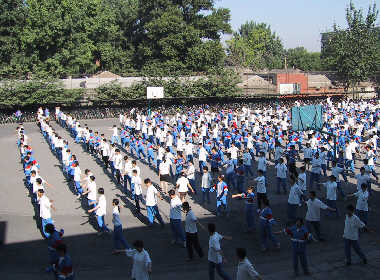 All students meet in the school yard with some teachers on duty. In a nearly military order they are standing in long rows, alternately a row of girls and a row of boys. 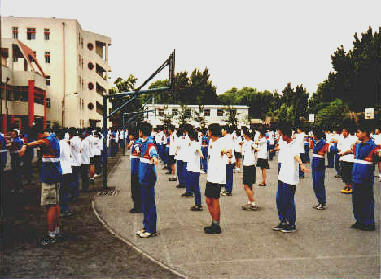 According to the orders of a teacher they do a 20 minutes exercise of concentration and gymnastics. After gymnastics they go to lessons at a few minutes to eight. 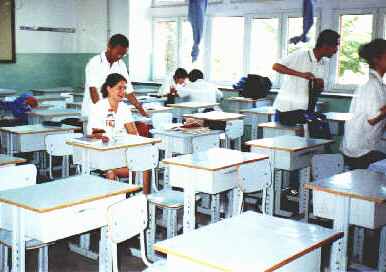 Classrooms are equipped with so many tables and chairs that there is hardly any space left for a small corridor where to walk. 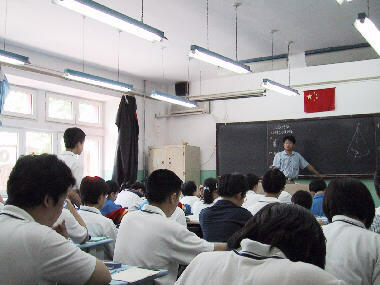 In each class there are between 55 and 60 students. But we still find a place for a chair for each of us from where we, the exchange students, can attend the lessons. Our first impression about Chinese lessons: It appears to be very much organized and in comparison to our lessons rather quiet. 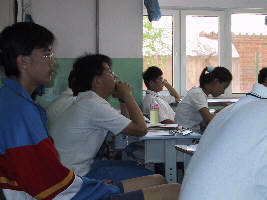 The Chinese students hardly participate actively during the lessons. Sometimes a student presents a prepared task or homework in class and every now and then the teacher asks a student to deal with a question. There are no marks for oral activities; consequently, there is hardly any motivation to ta actively take part in the process of the lessons. On the other hand there are also hard-working students who write down everything and show great interest, and there are of course - as well as in Germany - lessons which are well-prepared and interesting and those which are monotonous and boring. We were also able to take take part in the sports lessons which differ considerably from those in Germany. The students do not have special sports clothes; they wear their school uniforms like in all other lessons. Their sports lessons obviously have a different meaning compared to Germany: They are far less achievement-orientated. The girls were doing gymnastics on the floor where some of them had great difficulty in rolling forwards and backwards. The boys were playing either table tennis or basketball. On Monday after the lunch break you could always find some students cleaning windows or wiping the floor during the breaks. Monday is a "cleaning day" and the students are responsible for cleaning their school. Monday is a special day even in another aspect: Every Monday morning all students have to be present and line up for roll call. They get in well-organised lines in the school yard. Then three students appear in goose-step with the national flag and hoist the flag with a military ceremonial. Afterwards all present people sing the national anthem and one of the headmasters delivers a speech.